The Chamber Ambassador Program consists of enthusiastic Chamber volunteers who seek to grow professionally and personally by building business relationships within the community. If you have a desire to become more active in the local business environment, raise awareness about your business or organization, network, and give back to your community, the Ambassador Program is for you! Emissaries are advocates for the Chamber to current members. The Emissary Program is designed to increase membership value and retention rates. Members who are offered the responsibility of being an Emissary have already shown a strong sense of commitment and dependability by being an outstanding Chamber member. They are then extended an invitation to become a part of the Emissary Program. 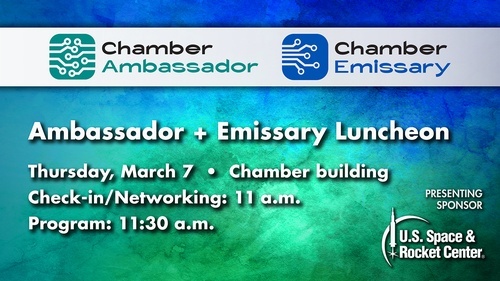 Both our Ambassadors and Emissaries donate a tremendous amount of time to build strong Chamber member relationships and raise community awareness. Every year, our Ambassadors and Emissaries donate more than 9,000 hours to this community and this Chamber is stronger because of them! Free for Ambassadors and Emissaries.